Molly Watman and Emma Graves developed these natural balms to soothe chapped lips, aches, and irritation. Your skin completely regenerates about every 27 days. It's pretty good at repairing itself, but that doesn't mean it doesn't need a little help every now and then. This set of four balms includes herbal remedies to soothe skin, soften lips, and even go beyond the surface. 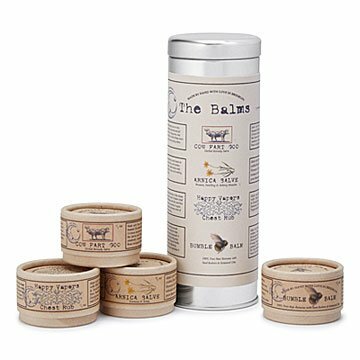 Created by Molly Watman and Emma Graves, each balm tackles a frequently faced malady: chapped lips, achy muscles, irritated skin, and cold-induced stuffiness. The makers (Molly's an artist who began studying herbs after her first child was born and Emma is a certified herbalist) source organic, sustainable ingredients, craft balms in small batches, and use their products with their own families. Share the set with your own family, give one to an ingredient-conscious friend, or try it yourself next time you're in need of some herbal TLC. Handmade in Brooklyn, New York.